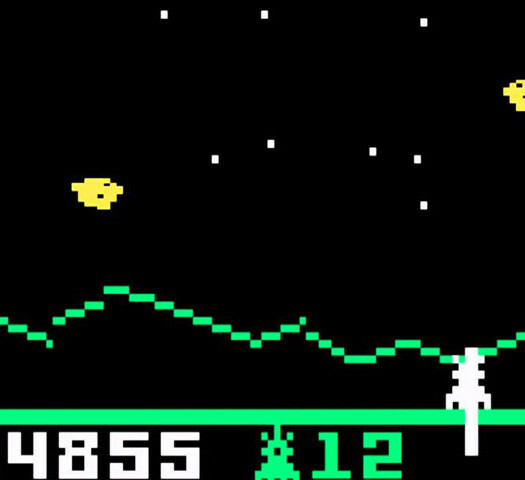 There are certain video games from my youth that stick out in my memory. The first hours of playing Metroid and The Legend of Zelda on a brand new NES were definitely a highlight, but there were games in the late ’80s and early ’90s that simply perplexed me. Dragon’s Lair looked like a playable cartoon, but with the exact keystrokes required to not get killed, the frustration became a bit of a joke after about an hour. Man Hunter was a Sierra-style adventure game set in a futuristic dystopia where aliens resembling giant eyeballs ruled society, but it was plagued with pointless mini-games as rudimentary as those found on a Nintendo Game & Watch. 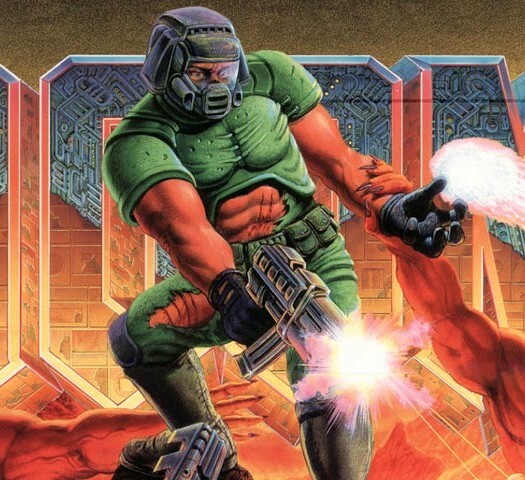 Such games only grasped my attention for a matter of hours, but before the release of Doom and its predecessor Wolfenstein 3D, I hadn’t really experienced much in the way of video game violence. 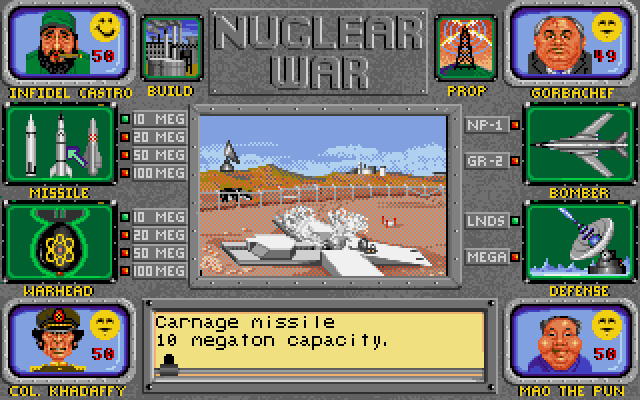 But one game my best friend’s older brother showed me at their house on an old Amiga 600, I’ll never, ever forget: Nuclear War. Soaking up some nuclear rays. Take first the box art. 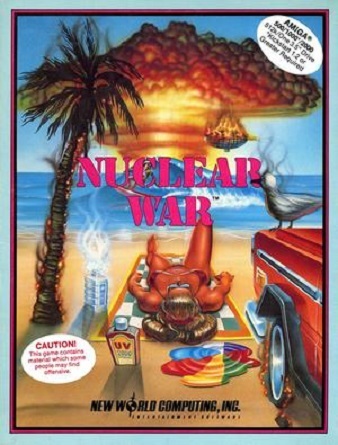 A bikini-clad woman lies sunbathing on a beach, a surfer pleasantly catches a wave as a mushroom cloud rises in the distance. While the bikini girl seems safely protected by the sun tan lotion on her skin and the surfer is happily hanging ten, the palm tree, the water bottle, the car tire and the seagull all seem to be roasting from the radiation and the beach ball is a melted puddle. It’s wrong on so many levels and as a nine year old I was a probably a bit too young to understand the ironic satire. Bear in mind though, Nuclear War was released in 1989 during the final years of the Cold War when the Berlin Wall was about to fall. Not that I was really aware of that political change at that point in my life. Making a game of nuclear warfare was not a new concept in 1989, television had already showed us how destructive computers systems could get in 1983’s War Games. Going back further, Nuclear War was actually a card game released in 1965 which had the pre-launch phases of stockpiling secrets and waging war with propaganda before the Armageddon. So what made this game such a stand out memory from my gaming youth? Probably the fact that I had never before seen a count of dead people in the millions. The cartoonish look to the game with caricatures depicting Cold War leaders like Margaret Thatcher, Ronald Reagan and the Ayatollah Khomeini was attempting to make nuclear war a fun satire, but I knew better. I was young and impressionable, and even though I probably wouldn’t have grown up to be a warmonger, even as a nine year old I could tell that this content was not appropriate, especially for kids. The one lesson I did learn was that in the situation of mutually assured destruction, nobody wins.